Reproductions In A Time Of The Culture Of Originality : 13.7: Cosmos And Culture An exhibition looking at the remarkable friendship and artistic collaboration between Michelangelo and Sebastiano sheds light on important questions concerning original art and copies, says Alva Noë. Michelangelo's Pieta in St. Peter's Basilica, Vatican City. 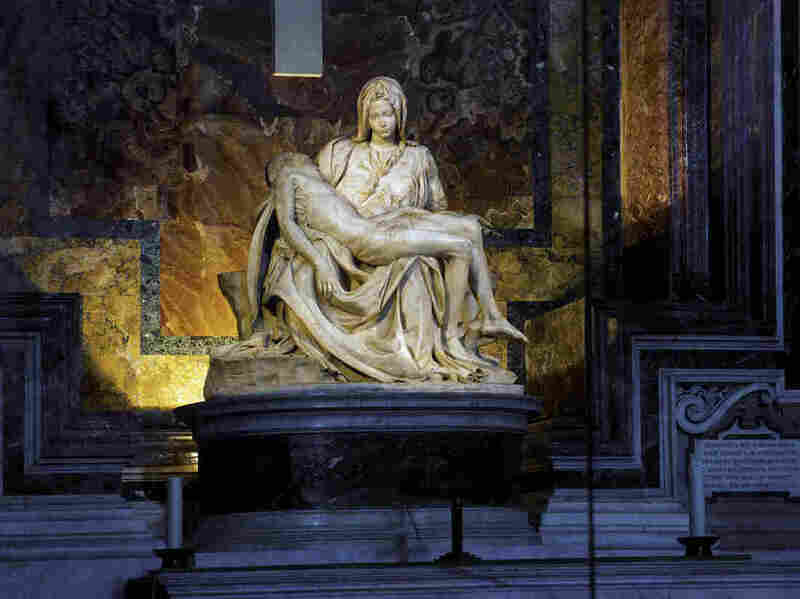 The first time I laid eyes on Michelangelo's Pietà in St. Peter's Basilica at the Vatican, I let out a sob. I don't know why. I was surrounded by a dense crowd of tourists; the sculpture was set back behind a thick Plexiglas panel. Whatever view I was able to enjoy was punctuated by the lights of auto-focus cameras reflected in the intervening panel. Despite the noise and distraction, or maybe because of it, I felt the power of the figure — the frail, boyish body of the dead Jesus limp across the lap of his powerful (indeed, disproportionately large), grief-stricken mother. I didn't have that sort of emotional reaction when I got to see the the Pietà again a few days ago in London, where it is on display as part of the excellent Michelangelo & Sebastiano exhibition at the National Gallery. This time, I could get right up to the work and examine it in all its striking detail for as long as I wanted, undisturbed by the throngs I had encountered at St. Peter's. I was not surprised to discover that the Pietà on display in London was not Michelangelo's original, but an exact replica manufactured in 1975. 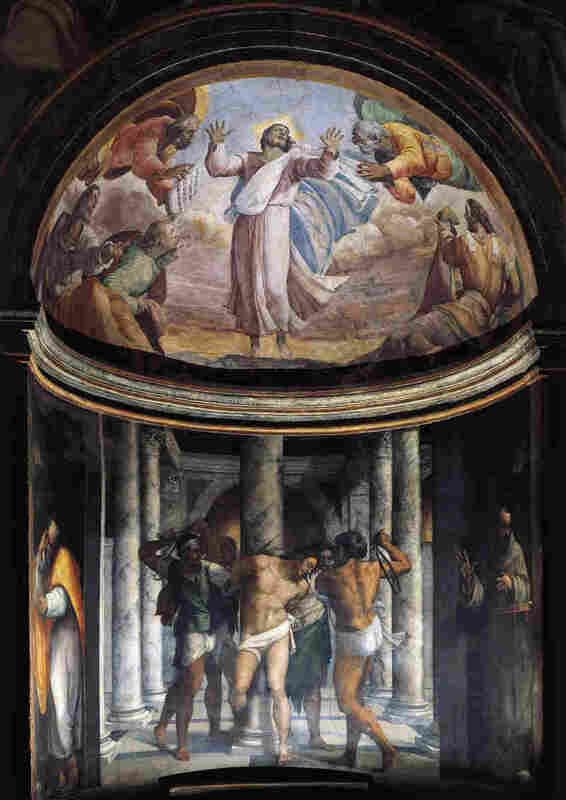 Flagellation of Jesus and the Ascension, 1517-1524, frescoes by Sebastiano del Piombo (1485-about 1547), Borgherini Chapel, Church of St. Peter in Montorio, Rome. Italy, 16th century. Might this explain my different response? Indeed, the show's high point is a remarkable new reproduction of the Borgherini Chapel, which is in Rome's Church of San Pietro in Montorio. The wall text does little to emphasize the remarkable imitation of the chapel on display: "This masterpiece [the chapel itself] is reproduced here at slightly reduced scale, using digital recording and printing technology." You need to go to the website of Adam Lowe's Faktum Arte group to get a sense of what an extraordinary technological achievement this is. The Faktum Arte team documented, digitally recorded, and then rebuilt the whole chapel, using a combination of contemporary materials and technologies as well as old styles of plaster work and construction. What results is a reproduction not of the original chapel as it was intended, but of the original as it is today in Rome. Everything from chipped pain and pock-marked plaster to the existence of a 20th-century Italian wall outlet embedded in the Renaissance plaster work are recreated. The result is breathtaking. I overheard the woman standing next to me in the museum exclaim: "It's incredible. I feel like I've been transported to Italy." Admittedly, there's something vaguely Westworld, or Walt Disney, about it. But in an era, such as our own, when most of us learn about the world's great works of art from reproductions in books, or even lower quality pictures on the Internet, it's hard to deny the value of this sort of superb reproduction. And, certainly, copies can be very useful. I haven't seen the original chapel in Rome, but I can describe it to you. I have seen the original of The Risen Christ. I recall it being partially covered, presumably out of consideration to Christ's physical modesty, or our own. It is in the copy that I was afforded an unobstructed view of the original, as it were. But there are other, subtler reasons why this show's reliance on copies and reproductions is strikingly appropriate. Nowadays, as the NYU art historian Alexander Nagel has argued, we as a culture tend to adhere to something like a "relic" conception of the work of art. We value the painting not just for what it is in itself but, rather, like a relic, for its presumed provenance. We, as a culture, participate in the cult of the originally produced work. For this reason, a mere copy, however informative as to the quality of its original, can never be a thing of commensurable value in its own right. But it was not always so. In the "copy cultures" of the past, works of art lived in and through their copies. Nagel gives many examples. In ancient Rome, copies of Greek statues were viewed as legitimate substitutes for their originals. And the tradition of the Byzantine icon was based on the idea that an icon was an adequate image of God or saint just in so far as it was an adequate copy of another sound icon. Nagel recounts that when Renaissance art collector Isabella d'Este "is asked by an aristocratic friend for her painting of Mary Magdalene, she replies that she would be happy to send it, but only asks for time to have a good copy made." The transition from a copy culture to a cult of original production is one that seems to have taken place in Michelangelo's day. "Michelangelo not only copied drawings by older masters, a common enough practice, but took the practice to a new level by copying not just the drawing's content (figures in certain poses, say) but everything about the older drawings, even the quality of the paper, which he smoked and stained to make it look old. The talk of smoking and tingeing suggests that Michelangelo also had to reproduce historically remote techniques and linear styles. He then returned his concoctions to the owners in place of the originals, presumably in order to see if they would pass and so gain him renown if and when the story got out, as seems to have happened." So it is somehow fitting that the curators of this exhibition have made free use of copies. In doing so — and in doing so with such a light touch — they cast a light on the fact that in the age of Michelangelo and Sebastiano, the status of a copy would have been uncertain and problematic. Actually, there's an even more interesting way in which this show engages with the problem of relics and copies. At the heart of the relic conception of the artwork is the idea that artworks carry powers bestowed on them by their authors or creators. Great artworks flow from the creative powers of great artists. And what makes an artwork special is that it can be traced directly to its creative source. But it is just this picture of the artist as a solitary font of creativity that is called into question by this show, with its focus on the remarkable 25-year-long friendship between Michelangelo and Sebastiano and, crucially, their collaboration. Typically, exhibitions built on the pairing of artists start from the curator's thought that one artist's work sheds light on the other's. This is the case, for example, with the SFMOMA Matisse/Diebenkorn show discussed here last week; and with the Rubens and Rembrandt show also up now at the National Gallery in London. But the situation is altogether different when it comes to Michelangelo and Sebastiano. The Borgherini Chapel was painted by Sebastiano using "designs" of Michelangelo. The same is true of other paintings in the show. Working at the dawn of the cult of the artist and the original reproduction, these two artists display an almost post-modern inventiveness when it comes to process, method, authorship, and result. I took a trip to Oxford, as well, and while there I paid a visit to the Christ Church Picture Gallery. I asked if I might be permitted to take a photograph. No, I was told, but pencils could be provided if I wished to make my own reproductions. This reminded me that the very idea of what it is to make one's own reproduction is now, as it was in Michelangelo's day, a moving target.